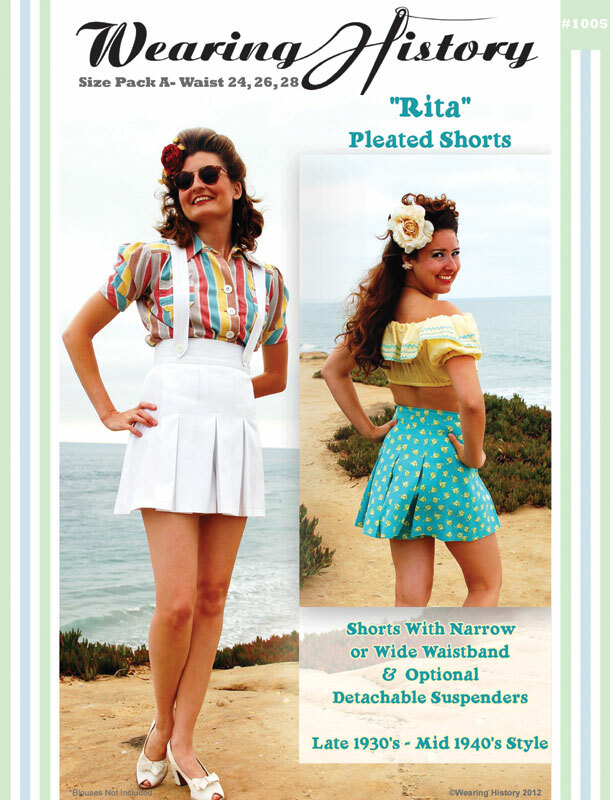 Home » 1930s » “Rita” Shorts- Official Pattern Preview with Pictures! I know I jumped the gun last night, but I’d like to officially announce pattern #1006- the “Rita” Pleated Shorts! This pattern is an original Wearing History design and was inspired by vintage mail order catalogs and magazine images from the late 1930s through the mid 1940s. These shorts feature three box pleats at the front, three box pleats at the back, a side zipper, and a narrow or wide waistband. When choosing the wide waistband option you can also add detachable suspenders! These shorts hit at the natural waistline (not low rise- “high waist” by modern standards). These shorts are meant to have a vintage cut with a bit of an updated fit, including a higher rise (crotch length) than vintage shorts, but a longer rise than modern shorts. It’s a happy mid-point that I think you will like! 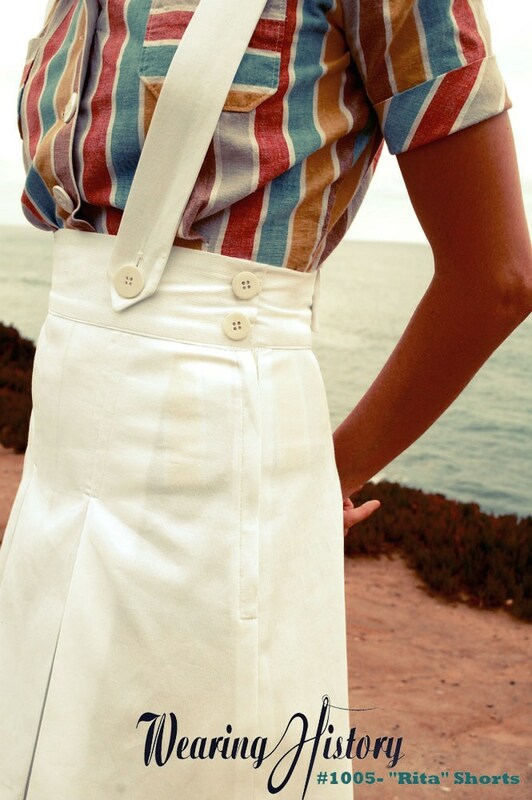 Although these shorts were inspired by late 1930s to mid 1940s images, these can easily carry you into the 1950s. By lengthening the rise of the shorts and the length they can work for mid 1930s styles as well, when done with the narrow waistband. These shorts make a great base for your creative embellishments. 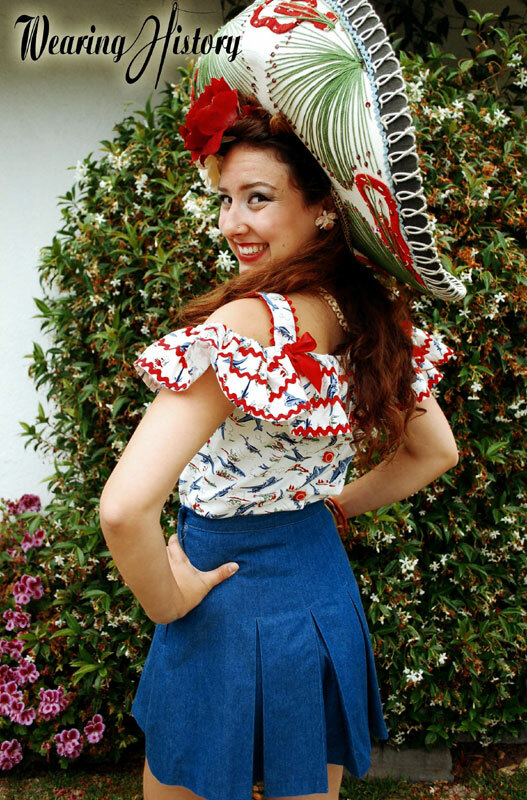 Add decorative buttons at the front for a sailor style, add piping to the high waistband and embroidery for a western style, or play with your designs in the form of appliques or fabric paint. They’re a fun and playful addition to your wardrobe. Make multiple pairs that are styled differently to keep your look unique. This pattern includes step-by-step instructions compiled and illustrated by me, as well as cutting charts for 45″ wide fabric. Blog tutorials for pleating and zipper insertion are coming up after the pattern release! These shorts look great in printed or solid cottons, linens, and rayons. These work best for dress weight or mid weight fabrics. They have a lot of “swing” to their movement! If you make a matching blouse this will make an adorable playsuit! 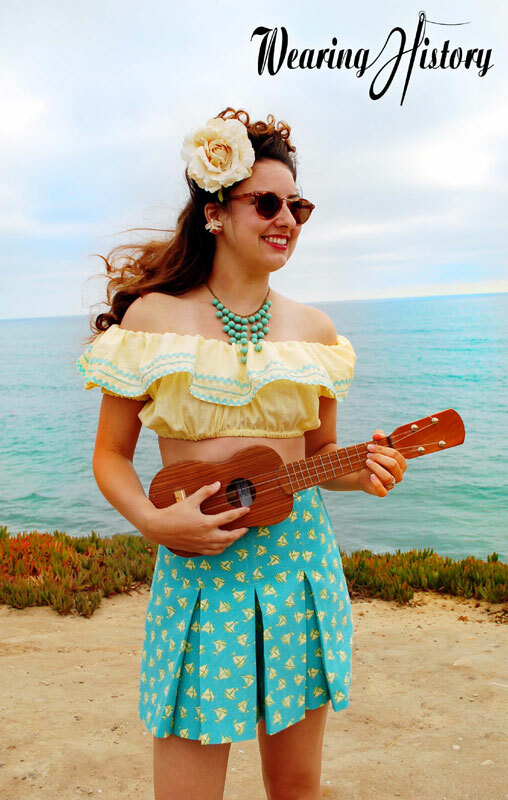 I suggest the Smooth Sailing Blouse, the Late 1930’s Beach Halter top (both tops shown above) or the the Sunkissed Sweetheart tie top as adorable companions to these shorts. You can purchase the Rita Shorts Pattern here on my website. « First Peek at The “Rita” Shorts! 17 Comments on “Rita” Shorts- Official Pattern Preview with Pictures! Lauren, I love this pattern! Mary has been begging for a pair of white, pleated shorts identical to this for a long time and I am far-too uncertain to try and make my own pattern. You guys look great. Also I didn’t comment yet on the crop top with the ric rac – so amazing!!! I made something similar for Mary without the ruffle and as is evidenced by your stellar handiwork, the ruffle & ric rac make it!!! These turned out SUPER cute! I must ask – where are you finding that airplane print fabric? If you wouldn’t mind sharing (I’ve seen that Jitterbuggin’ uses it too), I’ve be forever grateful. I’m in the Air Force and I’m absolutely in love with it. Thanks! Oh my! I think I just died of cuteness. The buttons, the rick-rack, the novelty prints; absolute love! I really like how the shorts are vintage/retro but wouldn’t look out of place at all for everyday, modern wear. I simply LOVE this pattern. Will it be available as a ‘digital’ pattern or just the paper kind? I’m sorry, I’m not planning on doing digital patterns. From your earlier post, can we gather that the peasant shirts shown with the shorts will soon be available, too? Perhaps! I’m thinking about it. Which one were you interested in? The shorter crop top or the one with the shoulder straps? Both are cute! And I’d wear either out doing yardwork; but the shoulder straps would work better with bras, making it more versatile for more figures, yeah? Oh my goodness, how sweet are these? I adore them and can really see myself wearing them, even though I don’t really do shorts! How exciting! Oh those are adorable! They may even make me break my “no shorts” rule! I wonder if these would work in a longer length or would it just be awkward… I just don’t have the legs to pull them off that short! They’re sure cute though. These shorts whizz me right back to my school days in the early 1960’s – these, in grey, were my gym shorts!